Because both Alzheimer’s and dementia run in my family, I am acutely concerned about my own brain health as well as anything that might damage it. 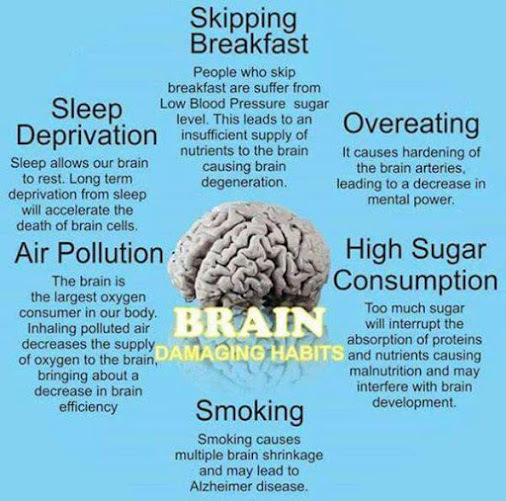 On the positive side, check out my Page Important Facts About Your Brain (and Exercise Benefits) as well as Important Facts About Brain Fitness. The final item names smoking. To learn more about the damage smoking does to your body and your general health, check out my Page How Many Ways Does Smoking Harm You? Reblogged this on Beach Bum Dreams. Sorry, I don’t understand what you are asking. Can you be clearer? Thanks for the valuable information Tony! I didn’t realize that skipping breakfast can be that harmful. Good to know! HI, Joan! Nice to hear from you. Happy to help!